How Jack Steele's form turned on its head and led to a rampant run home for the tough Saint. It was a suggestion that would have been laughed at. With just 22 votes from the first 12 rounds of the season, Jack Steele’s chances of finishing in the top three of the Trevor Barker Award were just about impossible. After a blistering 2017 campaign, the ex-Giant’s start to his second season at RSEA Park began with a rib injury, included a stint in the VFL and at best, some inconsistent AFL form. With the Saints’ winless streak out to 11 weeks, questions were being asked of almost every player. But Steele’s response was emphatic. After being hand-picked by Alan Richardson to perform a “run-with” role for the Saints, the Canberra product excelled. Instructed with shutting down dangerous Gold Coast on-baller David Swallow, the Saints’ No. 9 roared into gear in what shaped as a do-or-die game for his side. Steele took the field reenergised in his new role, stifling Swallow’s normally influential presence. The Sun averaged 3.8 clearances and 3.3 inside-50s in 2018, but he collected just a single statistic in both areas under Steele’s close watch. The 22-year-old earned 10 votes for his game-changing efforts against the Suns, kickstarting a rich vein of form for the bullish Saint. Kangaroo Jed Anderson falls victim to a trademark brutal Steele hit. Another successful shutdown job on Melbourne mid Clayton Oliver in the Saints’ remarkable Round 15 win earned him a further 13 votes, before he polled 18 a week later for nullifying the Power’s Ollie Wines. A stalemate with Patrick Cripps in Round 17 showcased Steele’s potent offensive ability. Amassing a then career-high 33 disposals (15 contested) at 97% efficiency, Steele was in everything against the Blues, collecting seven clearances, 10 tackles, four inside-50s and a goal. But given the All-Australian Cripps managed to pick up 35 touches of his own, Steele’s votes took a hit and he polled nine, down on his previous fortnight. Reigning premiers Richmond posed a monumental midfield threat for the Saints, with both Dustin Martin and Trent Cotchin in peak condition for the in-form Tigers. 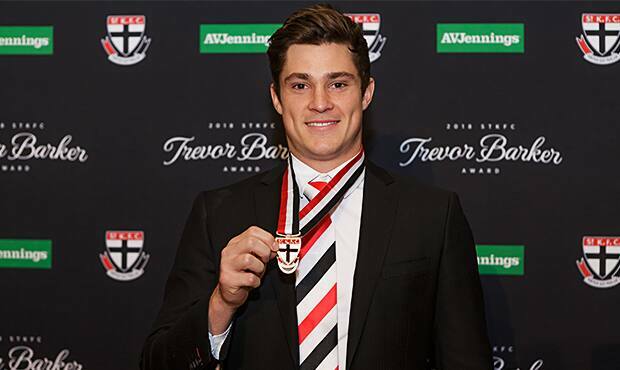 It proved a steep learning curve for Steele, who spent one half on each Tiger, but he battled on manfully and was rewarded by the coaches with seven votes. Starved of opportunity at his former club, something seems to stir in Steele every time he meets the Giants, and this was again the case as the proud Saint ran riot in Round 19. Callan Ward became the ‘Backpack’s’ latest victim, managing just 20 disposals and two clearances on an extraordinarily quiet night for Steele’s ex-captain. Steele finished 2018 in a flurry, suffocating Brownlow favourite Tom Mitchell in Round 22 before putting the breaks on North Melbourne’s Ben Cunnington in Round 23 to pick up 18 and 15 votes respectively. After Round 12, Steele earned more than six times his total votes in the first half of the season, his sensational run home enough to earn him third-place overall in the Trevor Barker Award with 134 votes. But it was his other award from which Saints fans can draw the most hope. For the second year running, Steele took home the Lenny Hayes Player Trademark Award in recognition of his courage, toughness, selflessness and team-first attitude. And if Steele’s emergence as one of the best contested midfielders in the competition is anything to go by, things are looking up at Moorabbin in 2019.